It’s funny isn’t how the mind works to put off what we really should be doing. I got up a couple of days ago with the express intention of starting to write a guest post for another blog that I had promised to do. Somehow, instead I decided that while checking out the other blogger’s email about what she was looking for, I should also check the rest of my email. That lead to another non-urgent task vaguely related to looking at my email that I needed to do, but could probably have waited until later in the day. Neil Gaiman is also having a similar problem – doesn’t want to do his proofreading apparently! So the result? Well I lost my prime-time writing opportunity of an early morning start. But I did reduce my unread emails slightly from two inboxes. And I wrote this blog post! I think this is a new title! It’s not always easy to tell after all – for instance there seems to be another title by Nigel Saul The Age of Chivalry, but this is only 144 pages, so I am guessing is something quite different? But then again there is also For Honour and Fame by the same author – see the related articles at the end of this post. There is a wealth of information on Amazon.com about the book, including lots of glowing reviews. I have read Nigel’s book on Richard II and remember very much enjoying, so I am sure that this and anything else he might have published on Chivalry will be good too! Nigel Saul takes a relatively benign view of medieval noblemen. He rejects the once-fashionable notion that war was all about money and land, and that chivalry was just tinsel. And, although he sees a steep decline in standards in the last medieval century, he thinks that chivalric values did have a real influence in civilizing the conduct of war. Whether one agrees with this or not, his is a view that commands respect. He is a historian with a rare gift for seeing the human lives behind the rather formulaic and impersonal sources of medieval history, and he has written widely about aristocratic culture…Saul can make the most unpromising material speak to us with a directness that can surprise even those who are already familiar with it. This is a rich book that does ample justice to its complex theme. The author of this sparkling book that “puts chivalry centre-stage” explains its substantial contribution to the development of Western civilization through links to the practice of treating prisoners of war with compassion, to the growth of individualism and even to the modern cult of celebrity. Splendid…Saul has drawn heavily on what he calls this “rich repertory of contemporary witness” to illuminate the relationship between chivalry and the political, military, social and artistic currents of the time. The result is a wide-ranging examination of how the ethos of chivalry defined and shaped knightly culture…As this book so ably demonstrates, [chivalry] influenced every aspect of knightly life: without it, the Middle Ages would have been not only duller and darker, but even more brutal. An entirely original project, and in [Saul’s] hands it proves illuminating…[A] brilliant book. The skill and scholarship with which he has done so fully justify his claim at its opening that chivalry was a major factor throughout the narrative history of medieval England from before the time of Richard I to the aftermath of that of Edward III. Chivalry has often been neglected by historians in that story; Nigel Saul’s vivid and exciting study should make sure that it can never again be left out of the account. The era of chivalry was the idealized fantasy that grew out of the military superiority of the armed horseman, and which lasted roughly between the invention of the stirrup and the invention of gunpowder. Nigel Saul is just the right person to tell the story as experienced in England…One of the strengths of his new book is its attention to the visual and the material. The knights of England had property and wealth, and they flaunted them. Chivalry was not only a code of behavior but a style honed both on the battlefield and in impressive residences…Interest in chivalry was revived in the Victorian cult of things medieval, aesthetic as well as moral in scope. It inspired such initiatives as the Marquess of Queensberry’s rules and the codification of laws of war, which Saul links to the later formulation of the Geneva convention. Yet lampoons of chivalry are equally powerful, as epitomized by John Tenniel’s drawings of ungainly knights on horseback that illustrated Through the Looking Glass. That unyielding parody has given us the chivalry of Monty Python and Spamelot, and recently a new Camelot too. Nigel Saul’s clear-sighted history makes these survivals all the more apparent, and all the more puzzling. Popular views of medieval chivalry—knights in shining armor, fair ladies, banners fluttering from battlements—were inherited from the nineteenth-century Romantics. This is the first book to explore chivalry’s place within a wider history of medieval England, from the Norman Conquest to the aftermath of Henry VII’s triumph at Bosworth in the Wars of the Roses. Saul invites us to view the world of castles and cathedrals, tournaments and round tables, with fresh eyes. Chivalry in Medieval England charts the introduction of chivalry by the Normans, the rise of the knightly class as a social elite, the fusion of chivalry with kingship in the fourteenth century, and the influence of chivalry on literature, religion, and architecture. Richard the Lionheart and the Crusades, the Black Death and the Battle of Crecy, the Magna Carta and the cult of King Arthur—all emerge from the mists of time and legend in this vivid, authoritative account. When a bishop dies the bells ring in heaven according to Matthew Paris. Presumably this was only becayse Robert, Bishop Lincoln was a fairly holy rather than venal example. Indeed this was actually Robert Grosseteste the famous scholastic philosopher and theologian, who criticized the greed of the papacy. I think it’s interesting that only the friars and priests hear the bells though – the bumpkin foresters don’t! Also it’s interesting that the melodious music is like bells – I guess the link with a place of worship is important here, but is really that the best that heaven could come up with to welcome the bishop? These are extracts from the Chronica Majora written by Matthew Paris for the year 1253. During the night in which the said bishop departed to the Lord, Faulkes, bishop of London, heard in the air above, a wonderful and most agreeable kind of sound, the melody of which refreshed his ears and his heart, and fixed his attention for a time. Whilst listening to it (he was at the time staying near Buckdon), he said to some persons standing near him, “Do you, too, hear what I do?” Whereupon they asked him, ” What hear you, my lord ?” The bishop replied : “I hear a supernatural sound, like that of a great convent-bell, ringing a delightful tune in the air above.” They, however, acknowledged, although they listened attentively, that they heard nothing of it, whereupon the bishop said to them: ” By the faith I owe to St. Paul, I believe that our beloved father, brother, and master, the venerable bishop of Lincoln, is passing from this world to take his place in the kingdom of heaven, and this noise I heard is intended as a manifest warning to me thereof, for there is no convent near here in which there is a bell of such a sort and so loud. Let us inquire into the matter immediately.” They therefore did so, and found, as was proved by the statement of his whole household, that at that very time the bishop had departed from this world. This wonderful circumstance, or rather primitive miracle, was told as a fact, and borne evidence to, to the writer of this book, by Master John Cratchale, a confidential clerk to the bishop, one held in great veneration, and of high authority amongst his attendants and friends. Of the noises of trumpets and bells heard in the sky. On the same night, too, some brethren of the order of Minorites were hurrying towards Buckdon, where Robert, bishop of Lincoln, was staying (for he was a comforter and a father to the Preachers and Minorites), and in passing through the royal forest of Vauberge, being ignorant of its windings, lost their road, and whilst wandering about they heard in the air sounds as of the ringing of bells, amongst which they clearly distinguished one bell of a most sweet tune, unlike anything they had ever heard before. This circumstance greatly excited their wonder, for they knew that there was no church of note near. When morning’s dawn appeared, after wandering about to no purpose, they met some foresters, of whom, after obtaining directions to regain their right road, they inquired what meant the grand and solemn ringing of bells which they had heard in the direction of Buckdon to which the foresters replied, that they had not heard and did not then hear anything, though the sound still gently filled the air. The brethren, therefore, in still greater wonder went on, and reached Buckdon betimes, where they were informed that at the very time of the night when they had heard the aforesaid melodious sounds, Robert, bishop of Lincoln, breathed forth his happy spirit. From this recent reconstruction of his face he doesn’t look like the most pleasant of characters does he! Over-fed and arrogant are characteristics that spring to mind in fact. You can read more about the reconstruction over on the BBC website. Simon Sudbury, Archbishop of Canterbury when he met his violent death during the Peasant’s Revolt of 1381, was just one of the high profile figures who met their end during the uprising. As well as being Archbishop he was also Chancellor of England and seen by many of the peasants as one of the principal instigators of the dreaded poll tax. Sudbury was dragged to Tower Hill and, on 14 June 1381, was beheaded. His body was afterwards buried in Canterbury Cathedral, though his head (after being taken down from London Bridge) is still kept at the church of St Gregory at Sudbury in Suffolk, which Sudbury partly rebuilt. Of course there is another sea above the one we know of – didn’t you realise! One credulous medieval writer certainly seemed to think so. I came across this extract from Gervase of Tilbury’s Otia Imperialia in C. G. Coulton’s Social Life in Britain from the Conquest to the Reformation, which is a great repository of all things medieval – from the mundane to the most fantastical of medieval marvels. Gervase of Tilbury was an Imperial official in the 12th and 13th centuries, and wrote a number of works including the Otia Imperialia, which is a miscellany of various wonders – many of them seemingly very fanciful. I love this one about villagers coming across an anchor in a churchyard one foggy day and then a sailor comes down from the misty heavens to free the anchor. As if this isn’t evidence enough of ships sailing above us in the clouds, Gervase then backs this up with another story of a man sailing far overseas losing a knife overboard, and it then landing on his wife’s kitchen table far below. There are some who say that the earth, as a centre in the midst of a circumference, is equally distant from all these extremities, and is surrounded and shut in by sea, even as it is written of the third Day of Creation, “God gathered together the waters that were under the heaven into one place, and dry land appeared.” In our own times there befel a marvellous, but well-known event to prove how the upper sea lieth above us. On a certain holyday in Great Britain, after High Mass, the folk were thronging forth from the parish church, on a morning so misty that it made a sort of twilight amid the gross and watery vapours. Here, on a stone tomb within the precincts of the churchyard, they found an anchor fixed, with its cable stretched tight and hanging down from the air. The people stood in amazement; and, while they were disputing among themselves of this matter, at length, they saw the rope move as though men had been labouring to weigh the anchor. When therefore, for all this straining at the rope, the anchor yet clung to the tomb, they heard through the foggy air as though it had been the cries of sailors labouring with all their might to raise an anchor from the deep. Soon, when they found their labour to be in vain, they sent down one of their fellows, who, as skilfully as any shipman of our own, appeared hanging to the rope and descending with alternate interchange of hands. When, however, he had torn the anchor from the tomb, he was caught by those that stood around, in whose arms he gave up the ghost, stifled by the breath of our gross air as a shipwrecked mariner is stifled in the sea. Moreover his fellows above, judging him to be wrecked, after an hour’s delay, cut the cable, left their anchor, and sailed away. In memory of which event the iron bands of the doors of that church were forged, by a cunning counsel, from that anchor; which bands are still there for all men to see. Here again is a still more marvellous testimony. In the county of Gloucester is a town named Bristol, wealthy and full of prosperous citizens; from this port men sail for Ireland. It befel upon a time that a native of Bristol sailed to Ireland, leaving his wife and children at home. Then, after a long sea-voyage, as he sailed on a far-off ocean, he chanced to sit banqueting with the mariners about the hour of tierce; and, after eating, as he washed his knife over the ship’s side, it slipped suddenly from his hands. At that same hour, at Bristol, the knife fell in through the roof-window of that same citizen (which men in the English tongue call dormer) and stuck in the table that was set before his wife. The woman, marvelling at so strange a thing, was dumbfounded; and, laying aside this well-known knife, she learned long afterwards, on her husband’s return, that his misfortune had befallen on the very day whereon she had found it. Who, then, will now doubt, after the publication of this testimony, that a sea lieth over this earth of ours, whether in the air or above the air? is the third volume of Jonathon Sumption’s epic history of the Hundred Years War. If you want to read about every turn of this conflict then I would recommend this series of books. I got this in hardback when it came out and its now going to be published in paperback – next March that is in the UK – so perhaps one to pre-order! Although I see if you follow my link above the US edition is coming out this autumn. Here’s some more details from the publisher’s website. Divided Houses is a tale of contrasting fortunes. In the last decade of his reign Edward III, a senile, pathetic symbol of England’s past conquests, was condemned to see them overrun by the armies of his enemies. When he died, in 1377, he was succeeded by a vulnerable child, who was destined to grow into a neurotic and unstable adult presiding over a divided nation. Meanwhile France entered upon one of the most glittering periods of her medieval history, years of power and ceremony, astonishing artistic creativity and famous warriors making their reputations as far afield as Naples, Hungary and North Africa. Contemporaries in both countries believed that they were living through memorable times: times of great wickedness and great achievement, of collective mediocrity but intense personal heroism, of extremes of wealth and poverty, fortune and failure. At a distance of six centuries, as Jonathan Sumption skilfully and meticulously shows, it is possible to agree with all of these judgments. 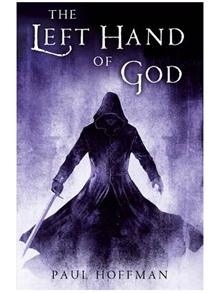 Left Hand of God and Agincourt – not sure about this one? You’ll need to have read Paul Hoffman’s Left Hand of God to appreciate this, so that’s why I’ve flagged this up as potentially a spoiler. If you’ve read the book you’ll know that nest the end of the book there is a big battle between the Materazzi and the Redeemers. 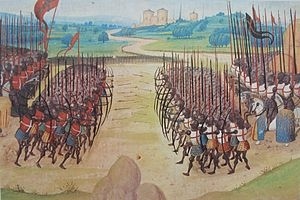 What I found unusual about this is that the battle pretty much exactly mirrors the historical battle of Agincourt of 1415. So the redeemers are the English, lots of archers, smaller numbers, and the Materazzi are the heavily armoured and over confident French. The battlefield is a narrow muddy field flanked by woods, the Redeemers use stakes to protect themselves from the Materazzi, etc etc. The only detail I think that is different is that there’s no equivalent of the French attack on the English camp that prompted the English execution of prisoners. As a description of Agincourt it’s all very good. But for me it doesn’t feel quite right in a fantasy novel. I enjoy the way that Hoffman plays with historical events in this book, so we have a pseudo Christian religion, we have a sort of WW2 eastern front allusions, we have place names such as York, Memphis, and Norway used, but not in their historical and geographical contexts. All well and good and nicely thought provoking, but somehow the dumping of Agincourt into the book didn’t work for me. You may have seen this before, but I think it’s so good it’s worth another look. If not then enjoy. Is it right though? It’s a great work of art and all that, but it does rather obscure the original building I think? What do you think? 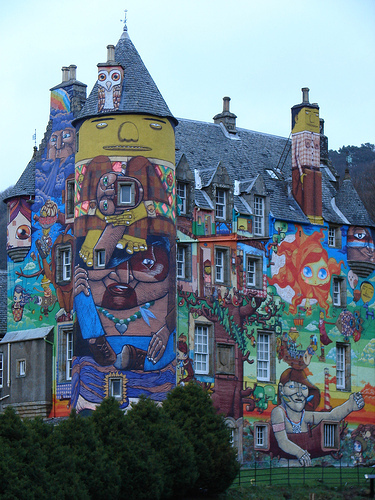 The castle is Kelburn Castle in the Scottish seaside town of Largs. For the full story see Business Insider and Deutsche Welle.